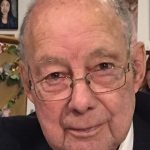 French, Robert Ivan 90, of Kamloops BC formerly of Savona, passed peacefully early Sunday July 2nd with his family nearby. Born to William and Ethel November 28th 1926 in Strasbourg Saskatchewan. Predeceased by his parents, brothers Homer and Stirling, sister Cecelia, his loving wife Esther, son Len and daughter Sue. Bert leaves to cherish his memory son Bob (Linda), grandchildren Stefanie (Marc) and Curtis (Teala), daughter Kathy (Alec), grandchildren Graeme, Mitchell (Sarah), and Sarah. He also leaves daughter in law Yvette, grandchildren Teena (Steve) and Richard (Holly), and son in law Dave and grandchildren Michael, Melissa (Tony), Brandi (Duane) and James (Sarah) as well as great grandchildren Stephen (Sara), Megan, Delaney, Leah, Aiden, Jackson and Aubree and great great grandsons Jace and Kayden. He also leaves numerous nieces and nephews and many special friends. Bert was a proud member of the Operating Engineers Local 115, recently receiving an award for 60 years of service. He spent many happy years as a member of the Savona Volunteer Fire Department and served as Chief for a lot of years. Dad also enjoyed his time as a Savona Lions member and was proud of his many years being involved with the Old Age Pensioners. Bert was an active member of the community and volunteered his time on many projects. Bert left Northern Saskatchewan in 1949 travelling to Prince George where he worked in sawmills and logging camps, eventually joining the Operating Engineers in 1955. He worked on many construction sites across the province, gathering friends along the way. During his career he helped build highways, rail beds, dams, and mine sites. In 1956 he married the love of his life Esther Davis and together they raised their four children in various locations across BC. In 1972 they moved to Savona where Bert built the family home, residing there for forty two years. With great sadness they moved to Kamloops to a smaller home and yard, leaving the community they loved so much. Bert will be greatly missed by all who knew him. Looking for grandson Michael French email me.